Bar Charts or Bar graphs are those graphs where we find many bars of different colors and lengths arranged in a straight line. These charts consist of rectangular bars of sizes proportional to the data they represent. These charts are used to draw comparisons between data using these bars. When comparing data, different colors and patterns are assigned to these rectangular bars. Bar charts can be drawn vertically and horizontally, arranging the bars accordingly. A basic bar chart is drawn vertically and is called a vertical bar graph. A horizontal bar chart is used when there are a lot of categories involved and they can’t be fitted into the horizontal axis. Vertical bar charts are also referred to as line graphs. Bar charts compare different categories and changes in them. They are preferred over the other charts when dealing with larger numbers and data. The x-axis in this represents the data being compared and the y-axis denotes the measured value. Two types of data are conveyed through bar charts, namely; nominal and ordinal. Nominal data consist of descriptive data, that aren’t ordered, which provides information regarding an event or a group. For example, the subject studied at a university. Ordinal data unlike nominal data is in an orderly fashion and can include different categories too. For example, a restaurant taking a survey from its customers about their service. 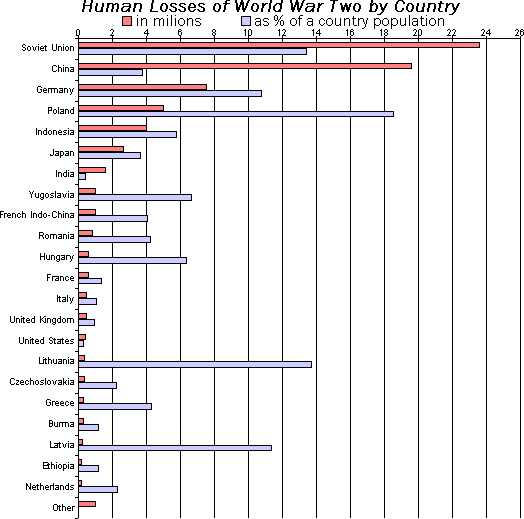 An example of a bar graph is illustrated below, showing human loss faced by two countries, during the world war. 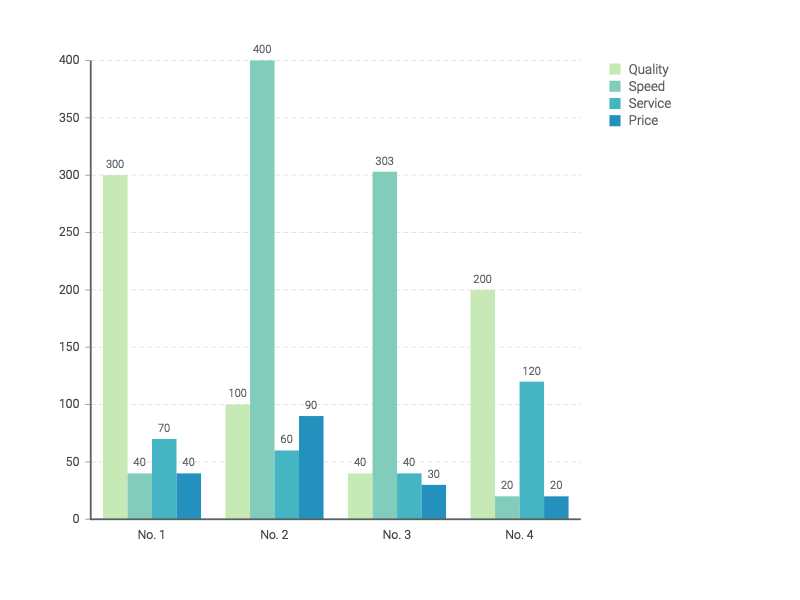 There are different types of bar charts available that represent categorical data. Typically, a bar graph is drawn vertically and the taller the bar is the larger the category is. This type of chart is used when the number of categories is more or the titles are longer, making it difficult for it to be included in the horizontal axis. That is, the longer the bar, the larger the category. Below are some illustrated examples of horizontal bar charts. Grouped bar charts are known by many names, column bar charts, multi-set bar chart, clustered bar graph, multi-set bar chart, etc. This chart type is used to compare categories of different groups and can be drawn vertically or horizontally, based on our needs. Multiple series can be compared in different categories using this chart. The bars representing each category are arranged side by side, such that the differences in the same group is visual and easy to understand. 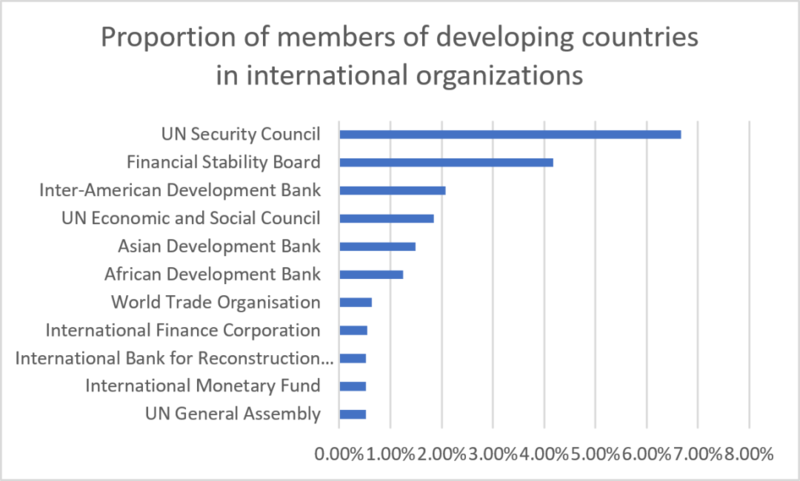 An example of a grouped bar chart is given below. Stacked bar charts are very similar to grouped bar charts. In this type of chart, sub-groups are displayed that fall under different categories. The sub-groups are placed on top of each other or side by side to make one rectangular bar. The height or length of the bar shows the category size that it denotes. To differentiate between the subgroups, each sub-group is given a different color. For example, take the number of girls and boys in a school learning a musical instrument. 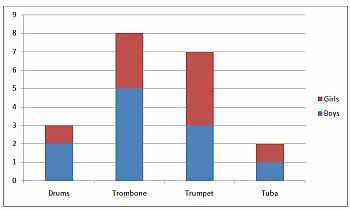 If you wanted to represent the percentage of total students playing the instruments, along with displaying what percent is boys and girls, a stacked bar chart can be used. Bar charts are made of simple rectangular bars, making it easier to draw them. The scales and figures are easy to read. It shows all the categories present in a distribution. Bar charts summarize large complex data into an easy visual format for understanding. Changes or differences in groups are easy to point out than in tables. Estimations and Calculations can be easily made using this chart. Bar charts are most effective with discrete data, such as rainfall over a month. It is hard to identify the difference between two bars with similar looking heights. Sometimes bar charts require additional information for readers to fully understand it. Only when bar charts show frequency distribution, each data category can be observed properly. Bar charts are very common and have lost impact on the readers. 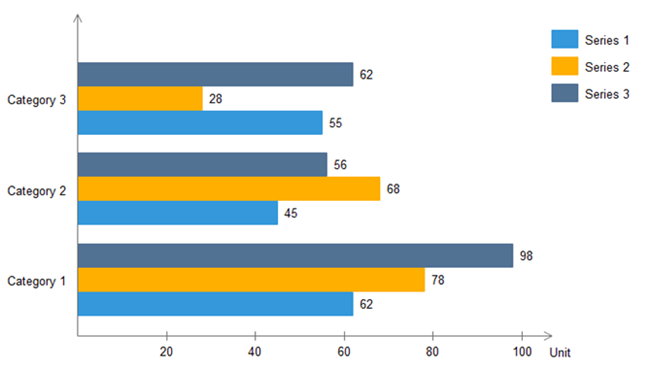 Bar charts often fail to mark key assumptions, patterns, and causes. Log scales are not allowed in bar charts, as they must start at zero. The tall bars may overshadow minute details. That’s all about bar charts and its uses. Hope this helped you with understanding the chart and choose the right type of chart for your data.